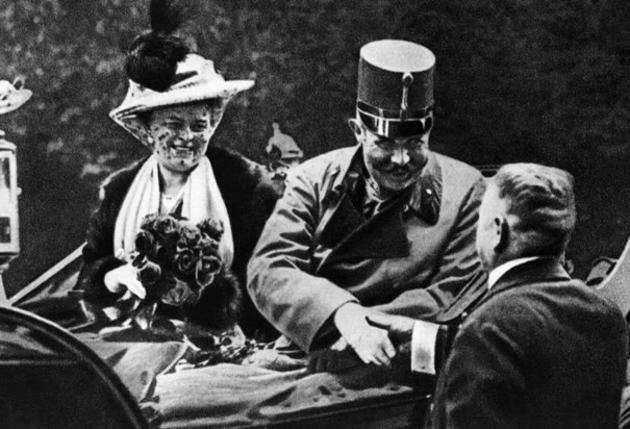 The shirt Archduke Franz Ferdinand was wearing when he and his wife were shot in the streets of Sarajevo in June 1914, sparking the fuse that led to World War I, is on display in Vienna. The blood-splattered garment, once white but now stained a dark brown, is being exhibited in a glass display case at the Austrian Military Museum. The museum contains more artifacts related to the assassination of the man who was heir to the crown of Austria-Hungary than any other location, according to the Guardian. The shirt was in the possession of the Jesuit religious order until 2004 when it was found in their archives and passed to the Austrian Military Museum on permanent loan. Because of its delicate condition it is only rarely put on public display, according to the publication. This time it will be viewable through the middle of next week in a dimly lit room. In my neck of the woods, putting quotation marks around words in the above fashion is often used to indicate a meaning atypical from that commonly associated with the term in question. 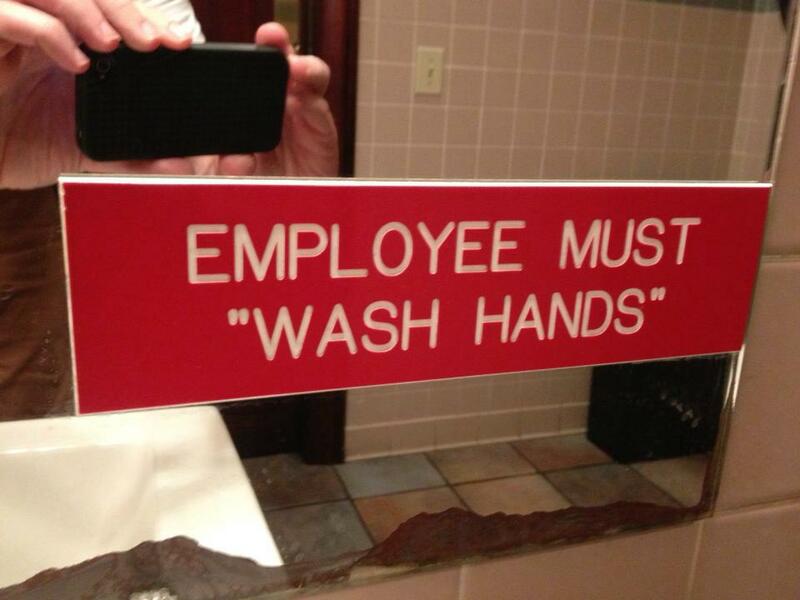 Given that, one wonders what meaning is intended by the recommendation that employees “wash hands”? Is the entire staff in on a big joke in which no one actually washes their hands after using the bathroom, but, should health inspectors stop by, it’s been agreed that everyone will say they wash their hands? Or is it more complex, in which employees go through some sort of ritual that falls short of effective hand-washing but enables them to assert they’ve made an effort? Perhaps they use soap but no warm water? Maybe they just run their hands under cold water? Could it be that they simply lick their fingers on their way out the bathroom door? Or, given that the sign says “Employee Must ‘Wash Hands'” perhaps there’s but a single designated employee who has to wash up after being in the bathroom; everyone else is exempt from this onerous regulation. That’s both the joy and agony of bad grammar: It’s hilariously confusing. Until the dysentery epidemic breaks out, that is. Given how this photo almost certainly came from a fast-food restaurant bathroom, I don’t know what would be more upsetting: To see this placard before one has eaten, when it can still ruin one’s appetite, or after one has dined, when it’s too late to head for another restaurant. You know, an establishment that takes hygiene, or at least grammar, more seriously. My 2013 Mess with Nature Tour found me in a small churchyard in a neighboring South Carolina county this past weekend, where I came across a clutch of killdeer eggs and one very aggravated mama killdeer. Prior adventures this summer in the never-ending quest to snare (and release) God’s creations include catching a baby turkey, catching and being bitten by two separate black snakes, catching but not being bitten by any of half a dozen Eastern box turtles, being outsmarted by several baby moorhens, along with numerous run-ins with lizards, skinks and anoles. The latest occurred while I was in a quiet graveyard off a two-lane state highway. The cemetery, enclosed by a beautiful old stone wall, was without trees and had little vegetation except grass. 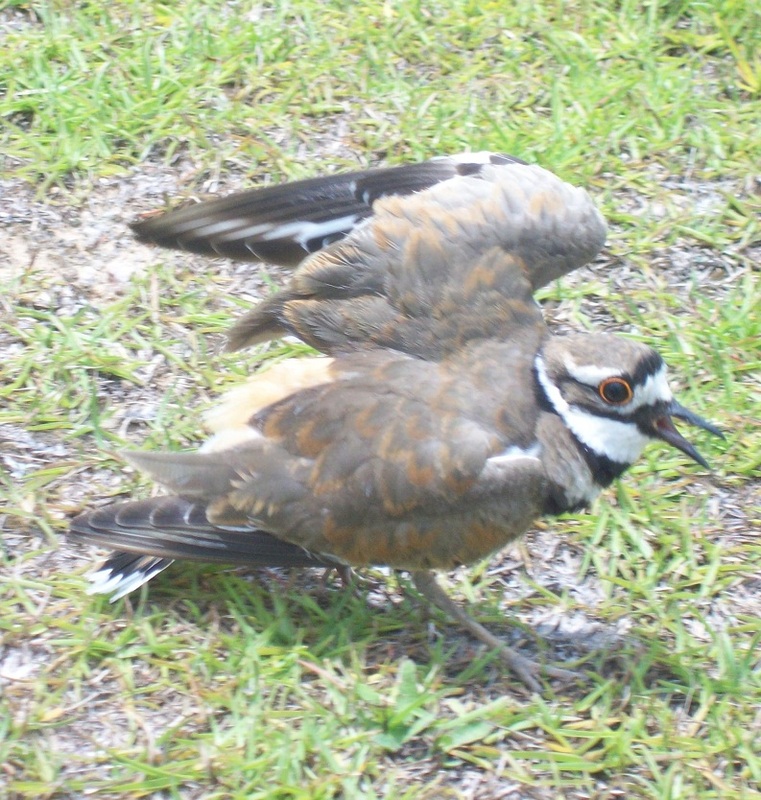 As I wandered about, an adult killdeer about 15 feet in front of me suddenly began plying its “broken-wing” routine, squawking and struggling to keep its balance. Thinking there were babies about, I quickly scanned the area, but saw none. With nothing but headstones in the graveyard I knew there was nowhere to hide, so I determined there must be a clutch of eggs somewhere close. I scoured the ground along a 20-square-foot patch of ground, but found nothing, so I then tried a bit of triangulation, seeing which movement caused the killdeer to come back toward me most rapidly. The Panama Canal took a decade to complete, cost the lives of thousands of workers and proved one of the largest and most difficult engineering projects ever undertaken. So why not a repeat performance? Earlier this month, the Nicaraguan legislature approved construction of a canal to compete with the Panama Canal, an endeavor that would double the number of shortcuts between the Atlantic and Pacific oceans. The project would apparently be built by a Chinese telecommunications equipment firm, with financing largely coming from China, according to the magazine The American. 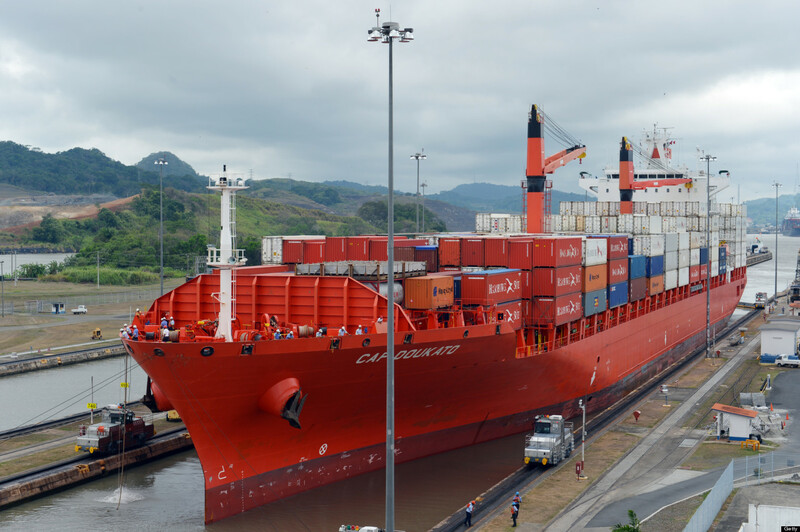 The project envisions building a canal as long as 178 miles (the Panama Canal is 48 miles, by comparison), as well as two deep-water ports, two free-trade zones, an oil pipeline, a railroad and an international airport, according to the Wall Street Journal. The cost is estimated at a staggering $40 billion, about four times the country’s annual gross domestic product. Supporters of the latest iteration of the project, approved last week, hope that it will propel Nicaragua out of its economic doldrums by bolstering employment and economic growth, added the Journal. 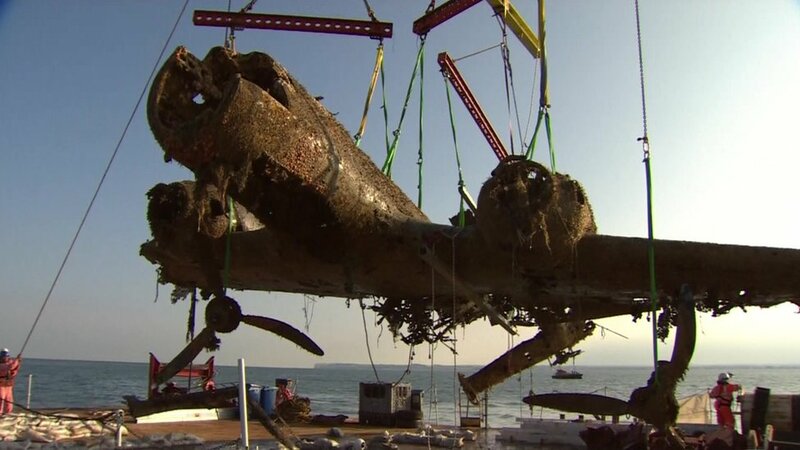 After more than 70 years on the floor of the English Channel, a German bomber shot down during World War II has been raised. The Dornier Do 17 aircraft was downed in August 1940 off the coast of Kent during the Battle of Britain. It is believed to be the only intact example of its kind in the world, according to the BBC. The aircraft, brought up last week, was found to be badly corroded, with the fuselage twisted and held in place only by a strut inserted by the salvage team. The plane’s engines were found to have come apart from the plane and had to be brought up separately. The existence of the Dornier Do 17 – nicknamed the Luftwaffe’s “flying pencils” because of its narrow fuselage – became known when it was spotted by divers in 2008 lying in 50 feet of water on a chalk bed with a small debris field around it. The Dornier will be restored at a site in Shropshire before eventually going on display at the RAF Museum in Hendon, north London. In my neck of the woods, one of the highlights of being a dad is being asked to make an appearance at “Career Day” when your child is in 4th grade. I was fortunate enough to be invited by my youngest to speak to her class recently, and, as always, it was a treat. 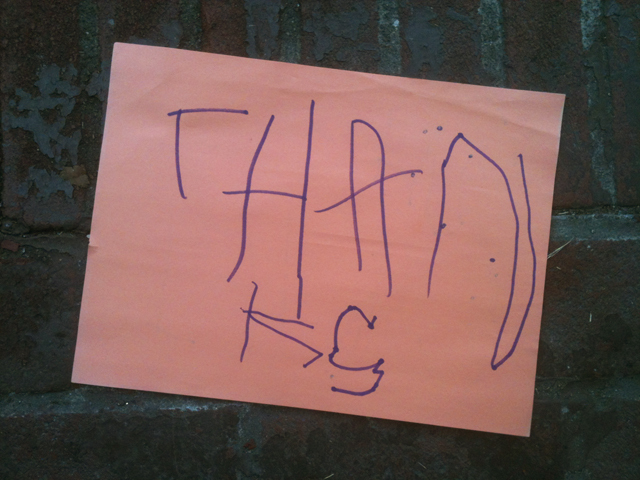 The favorite part of this year’s appearance, however, were the Thank Yous I received afterward. The notes were decorated elaborately; many in a variety of colors and inks, and all with the unguarded sweet words of appreciation that seemingly only a child can muster. It’s important to note that I work for a state banking association – a job I thoroughly enjoy, but not exactly what most 9- or 10-year olds would consider a glamorous position, or even one many at that age can comprehend. As a result I opted to skip planned discussions on the Federal Reserve System and Quantitative Easing, and a proposed Q&A breakout session on the merits of returning to a bimetallic monetary standard. Federal forces spent four years trying to silence Confederate guns on Fort Moultrie, but the massive iron weapons face just as formidable a foe today: the environment. To protect the 10 historic siege and garrison guns still located at the Sullivans Island fortification, preservationists have turned to technology, including computer sensors, in a bid to defend them from the salt and humidity omnipresent along the South Carolina coast. 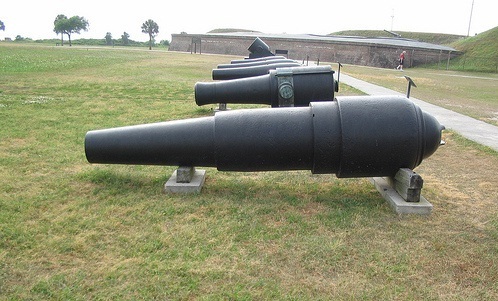 The guns of Fort Moultrie are of particular historical significance because they were among the weapons that were used to fire on Fort Sumter April 12-13, 1861, officially beginning the War Between the States. The conservation work, which included coating nearly all the guns in rust-retarding epoxy, is being done through a collaborative effort between the National Park Service and Clemson University’s Restoration Institute. The price tag for the multi-year conservation effort is $900,000.